Keith Mahipala, volunteered his services on several mission trips over the years, was a member of many student organizations, and was a great mentor/ leader in his class. His demeanor is one of a Christian who loves to help others while learning along the way. He is a good listener, is analytical, and is very mature and professional for a young man of his age. He will serve well in the capacity as a dentist and will brighten the smiles of those he serves. Dr. Parisa Tashakkori received the Doctor of Dental Medicine degree from East Carolina University School of Dental Medicine on May 6, 2017. 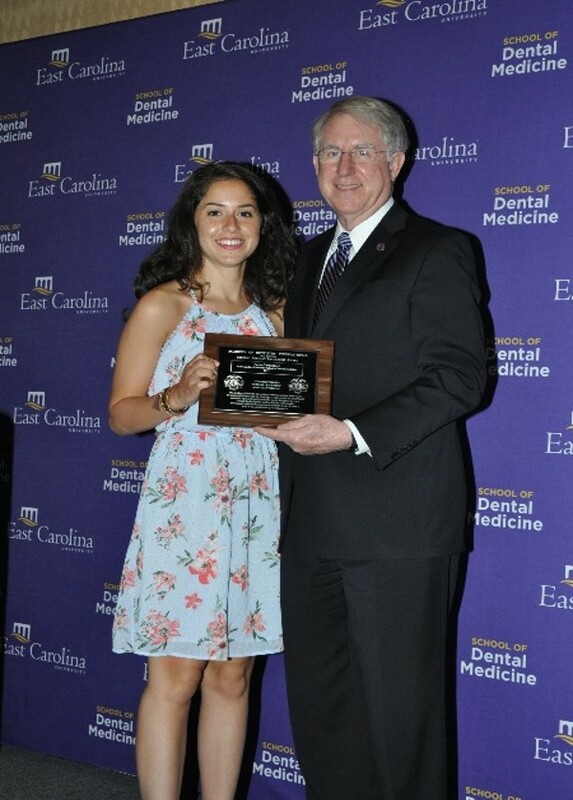 While Dr. Tashakkori was a dental student, she served as the Vice President of the Dental Student Government and the President of the ECU School of Dental Medicine American Dental Education Association (ADEA) Chapter from 2015 to 2016. She also served as Vice President of her class from 2014-2015. In addition to leadership, Dr. Tashakkori was actively involved in service during her time as a dental student and volunteered at the Joy Soup Kitchen, Missions of Mercy Dental Clinics, and a neighboring elementary school. Dr. Tashakkori will be practicing in Raleigh, North Carolina. Attitude and commitment are key qualities of a true professional. Ms. Owens knows the importance of diligence and hard work. She entered dental school with a Masters in Cell and Molecular Biology providing her with a strong clinician/scientist acumen. As a dental student, she has maintained a laudable service-related schedule while maintaining her academic record. She enjoys being involved in all aspects of dental school including volunteer activities and professionals organizations. Her selflessness is reflected in the broad scope of community service she participates in and organizes. She is the Philanthropy Chair of ASDA and the clinical coordinator for the Ozanam Inn project that provides collaborative dental and health care to homeless men in New Orleans. Her charitable and humanitarian spirit along with her ability to work collaboratively serving those in need will certainly distinguish her in the field of dentistry for many years to come. Diana is active in numerous organizations on campus serving in leadership positions with the Hispanic Student Dental Association and the Student National Dental Association. She organizes and participates in community health fairs throughout the area and participate in community outreach projects to increase oral health awareness in the Hispanic community. She is a volunteer coordinator for the Jackson Free Clinic and conducts presentations on oral health in the schools of rural Mississippi. Diana has also been involved with the Dominican Dental Mission Project working with experienced dentists to bring dental treatment to 5 different villages surrounding San Jose de Ocoa, Dominican Republic and has also been involved in dental mission trips to Mexico. She is fluent in Spanish and serves as a Spanish interpreter. We are excited for her to receive this award. Caroline Latta has been a stellar student clinically and academically throughout her four years at the UNC School of Dentistry. She has maintained her academic excellence of a 3.95 GPA consistently being in the top of her class while being involved in various school activities. This strong academic record puts her in the top 10% of her class, an accomplishment which led to her nomination as a Hinman Scholar. Caroline is an outstanding student and is pursuing an advanced dental education in general dentistry. She devoted numerous hours outside of school to bolster her clinical skills through volunteering at various community clinics and outreach events, including ENNEAD and CAARE clinic which provides dental services to the underserved population in Durham, NC. She volunteered regularly with the North Carolina Missions of Mercy, an organization which provides free dental care to the underserved of North Carolina. Caroline also had the opportunity to represent UNC on two international trips, feats which mandate countless hours of planning, coordination and fundraising. She has participated in a couple of CMDA and international mission trips, and is also planning to go with the group to the Dominican Republic this May. She has also helped with the Refugee Clinic, has participated in various community service/outreach activities at SACDC (Serving Our Heroes, Haven for Hope Children’s screenings, etc). As president of the HSDA, she has also implemented a couple of informative videos “Mi Gente Mi Diente” to educate about oral health issues. Stephanie truly has a heart for service to help the community and her peers. She has her priorities sorted when it comes to service. She also mentors other dental students in a very informal way and on a continuous manner (I have witnessed) and she will never say no to a project! She was a co-student leader at the refugee clinic last year and has numerous services hours at that clinic, she also has successfully completed the "leadership in community service learning" selective. Her commitment to outreach service activities is not just limited to her dental school tenure, it began during her undergraduate education. You might even say it is in her DNA.